The San Andreas Fault is one of the most famous geologic features of the world. It is common knowledge that the sides of the fault, relative to each other, are moving. 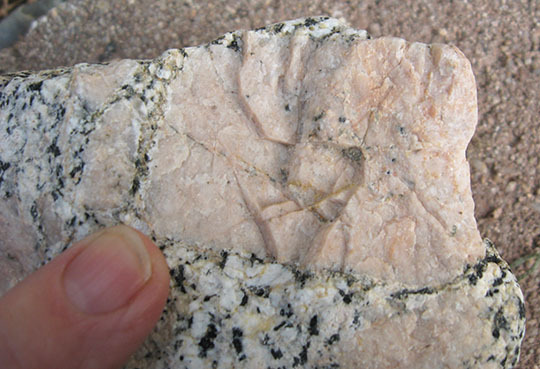 This post concerns a distinctive granite that has been displaced approximately 160 km (100 mi.) by this fault. 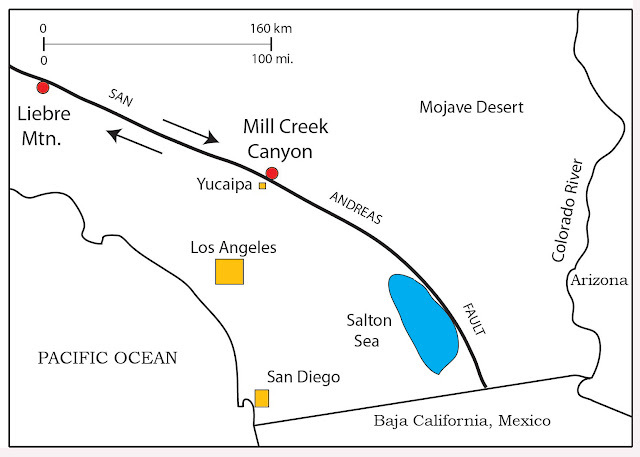 Map showing locations (in red) of the distinctive granite that has been offset by the San Andreas Fault in Southern California. The arrows show the relative sense of offset along the sides of the fault. Artwork is by R. Squires. The rock that has been displaced is, indeed, a type of the igneous rock granite. To be more precise, however, it is a megaporphyritic monzogranite. "Megaporphyritic" means that the crystals are of vastly different sizes. 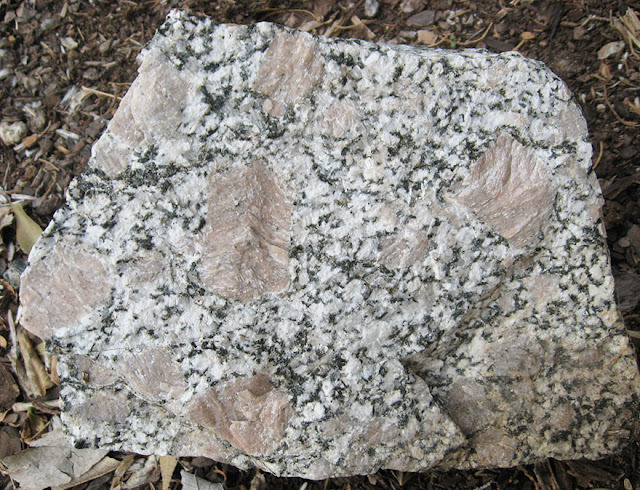 A monzogranite is the commonest type of granite with roughly equivalent amounts of orthoclase and plagioclase, along with abundant biotite. Megaporphyritic monzogranite hand specimen (20 cm length) from Mill Creek Canyon. The large pink crystals are orthoclase, the white ones are plagioclase, and the black ones are biotite. The orthoclase crystal just right of the center of the above picture show twinning. Crystal twinning occurs when two separate crystals of the same substance share some of the same crystal lattice. Instead of a normal single crystal, the crystalline structure appears doubled. There are several minerals that commonly have twinned crystals, and orthoclase is one of them. An exceptionally large crystal (4.5 cm length) of orthoclase from the Mill Creek Canyon locale. The rocks, which are found in the Liebre Mountain area in northern Los Angeles County and also in the Mill Creek Canyon area of San Bernardino County, are believed to have been part of the same intrusive magma body that crystallized during the Triassic, about 215 million years ago. The two rock masses, which were both derived from melted continental crust of Precambrian age, share identical chemical compositions and geologic age. They both also suffered a Late Cretaceous thermal event about 70–75 million years ago. Geologists refer to localities that show precise offsets along faults as "piercing points." Liebre Mountain is 100 km northwest of the Mill Creek area. 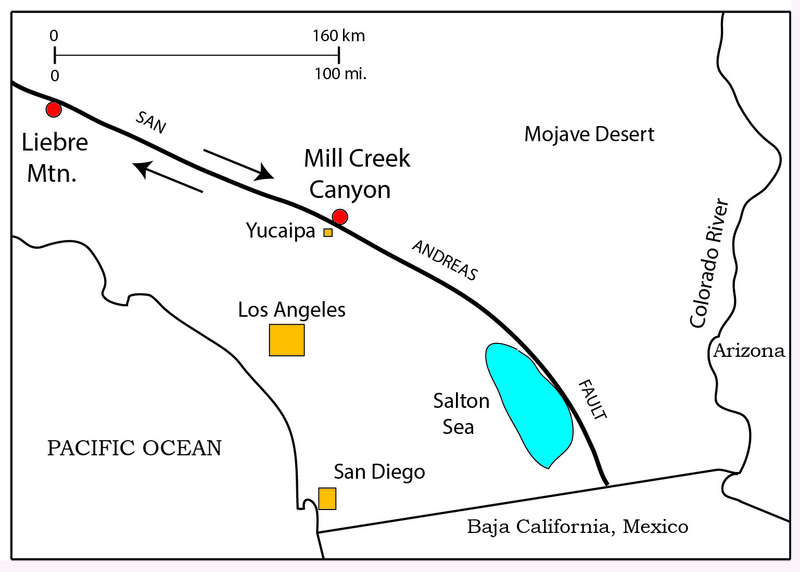 This distance of offset is less than the generally accepted distance of about 240 km of offset along the San Andreas Fault. Several years ago, I noticed a boulder-size piece of granite in the office of one of my colleagues, Dave Liggett. Over the years, I kept admiring the rock, and, one day, he kindly gave me some nice representative specimens. These are the same specimens illustrated here, and they are from the Mill Creek Canyon locale. He also provided the background story of this rock.